The Academy’s fine art studio facilities are designed to prepare you for a career in art and design. Our hands-on learning environment creates a culture that supports curiosity, investigation, and production. Online students are also hands-on, as they engage in discussions and activities through the online platform, social media, and real-time streaming of our events. Both online and onsite studio environments are equipped to give you the skills you need to create the career of your dreams. Use industry standard TIG-welders, power tools, sand blaster, and patina stations for bronze casting in our welding studio. Learn on a jet-milling machine for cutting metal, a McEnglevan MIFCO forge machine, a plasma cutter, and 250-amp welders. Also available are a fully-equipped wood shop, the only complete art and sculpture neon studio in California, and a mold-making studio for one, two, and three-piece plaster and rubber casts. Our painting facilities include twelve classrooms, two of which are full-time anatomy studios, and a full-time multimedia room with theatre seating. All classrooms and studios are equipped with easels, tabarets, model stands, spotlights, cleaning stations, and painting storage racks to accommodate any style of painting. The prop room is well stocked with over 100 fabrics and over 3500 different props for your reference. Our main printmaking facility includes six presses for intaglio, relief, and monotype printing. The intaglio and relief studio embraces both traditional as well as sustainable approaches with support for both zinc and copper etching. The silkscreen studio concentrates on the photo emulsion process and includes a dedicated darkroom. Fully stocked with ink, screen, light table, and digital output, the studio is designed for maximum productivity. 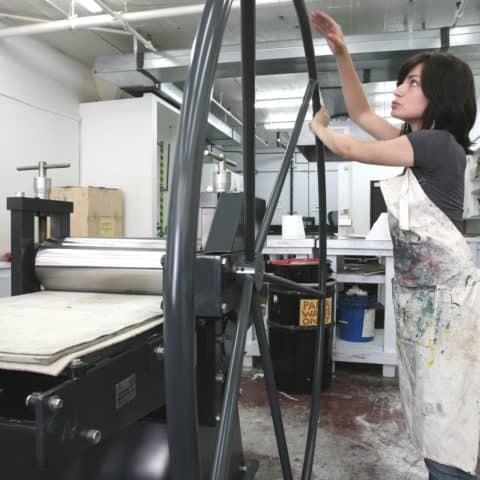 Also available are separate fully equipped lithography, book arts, and framing studios. Our sculpture center houses a complete wax studio with gating and sprue-stations, and a ceramics room with slurry tank, silica sand stations, front-loading computer programmed electric and gas kilns, a slab roller, extruder, and a pug mill. Jewelry & Metal Arts students have access to a 20-ton hydraulic press and enameling, lost wax casting, and calibrated burnout kilns. Learn about the contemporary technique of ceramic shell bronze casting at our foundry in South San Francisco, with our 150-lb metal crucible, burnout kiln, cut-off station, burr-king sander, and sand-blaster. We feature industry standard TIG, MIG, stick, and gas welders; power tools; a sand blaster; and patina stations in our welding studio. Experience emerging artists at one of our seven galleries across San Francisco. Each gallery is designed to promote the work of Academy students, alumni, and faculty. Your show could be next!